The University Center Ballroom was humming on Wednesday, April 27, with the voices of hundreds of UMBC students presenting their research and creative work to proud long-time supporters and curious first-time visitors alike. 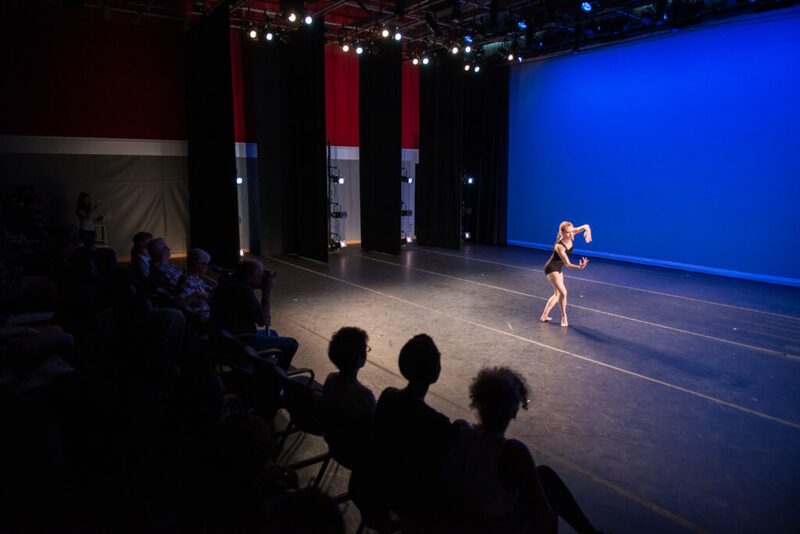 URCAD programming included performances, film screenings, exhibits, posters, and talks from all disciplines, as well as a large number of interdisciplinary partnerships. Aakash Bajpai ‘18, mechanical engineering, and three partners presented a collaboration with the Baltimore City Department of Public Works on research to anticipate when aging city pipes will fail before those incidents occur. Their research is also helping to determine why these pipes are failing and how the failures can be prevented in the future. Bajpai says that this project can save Baltimore millions of dollars by minimizing the disruptions caused by emergency repairs, moving toward a more proactive and cost-effective infrastructure maintenance approach. Joel Tyson ‘18, biochemical engineering, is studying probes to determine whether they are compatible with the chemistry of the human body, under the mentorship of Gymama Slaughter, assistant professor of computer science and electrical engineering. The probes will be used to simultaneously sense neurotransmitters and monitor the electrical activity in the brain. Analyzing the safety of the probes and how they interact with the body’s chemical composition will be essential for when the probes are tested on mice and, later, in human models. The sensor is being designed as a more effective, less invasive way to continuously monitor neurotransmitter release and the brain’s electrical activity in people with neurological disorders. 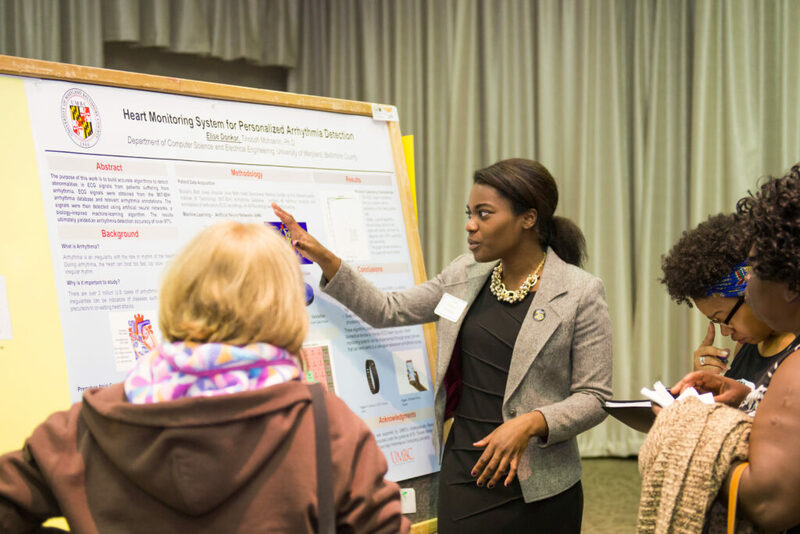 Elise Donkor ‘16, computer engineering, is developing more personalized software to better diagnose and treat patients experiencing heart arrhythmia. Unusual patterns in heart activity can be signs of conditions like diabetes or heart attacks. Current software designed to track heart activity is mass produced, Donkor explains, and personalization could make it a more effective tool. The algorithms that she has developed to detect abnormalities have shown a 97.8% level of accuracy in identifying arrhythmia patterns. James Loy ’16, mathematics and physics, works with Matthew Pelton, assistant professor of physics, on “quantum dots,” which are nanoscale semiconductor crystals. The dots may eventually be used as a lower-cost alternative to silicon-based solar cells. Using “acceptor molecules” to grab the excited electrons released by the dots increases overall electrical current output. Loy’s work showed that more acceptor molecules increased the output linearly, which is encouraging for future work to optimize quantum dots for eventual commercial use in solar energy harvesting. “Working in Dr. Pelton’s lab was the best part of my college career,” Loy says, noting “I experienced research from the posing of the problem through to publication.” Loy will pursue a Ph.D. in physics at Princeton this fall. Deirdre Lohrmann ‘16, ancient studies and history, studied Roman glass production in antiquity with a specific focus on glassware from the Marie Spiro collection. Viewing a display during UMBC’s Ancient Studies Week sparked her interest in the project, and she says that studying artifacts from Ancient Rome has helped her develop a greater appreciation and understanding of the world around her. “We learn from our past,” she says, to understand the similarities between people in antiquity and people today. Throughout the event, students shared the impact of mentors who served as guides through research and creative processes and as sounding boards on graduate school and career path possibilities inspired by their work. Featured URCAD speaker Mark Reynolds ‘78, ‘82 M.A., psychology, picked up on these themes. 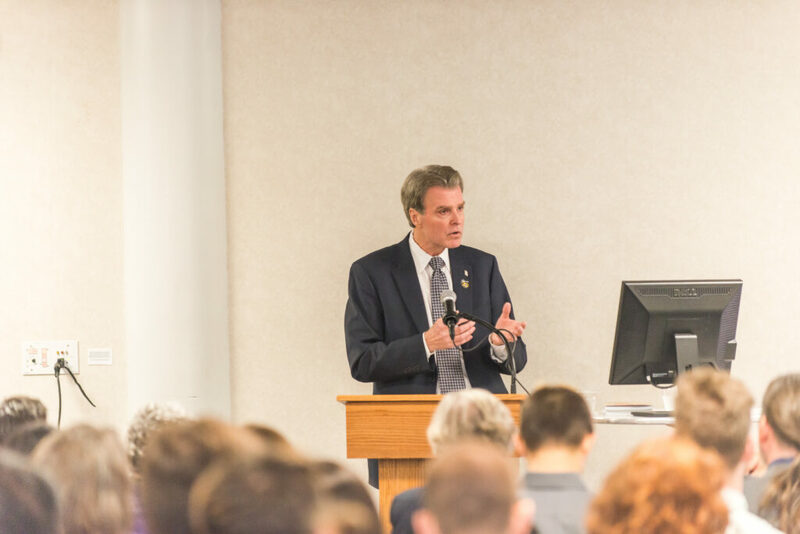 Reynolds, now dean of the University of Maryland School of Dentistry, shared how his undergraduate research experience paved the way for his career and how UMBC faculty mentors helped him develop a passion for teaching, learning, and supporting others. Visit the URCAD website to access the full list of student presenters. **Update: Dean Scott Casper and Provost Diane Lee invite the university community to a campus forum on Thursday, May 12, at noon in the Albin O. Kuhn Library and Gallery, where students Zoe Wang and Riley Auer will present their poster, “Illustrating the Unseen: Analogy and Metaphor in an Ancient Gynecological Text.” This event follows a decision made to move the poster before URCAD began and a thoughtful conversation that followed, regarding the important issues of the nature of artistic, humanistic, and scientific research and representation; the presentation of research to academic and public audiences; and the meaning and centrality of academic freedom. In addition to the presenting students, several members of UMBC’s faculty, including Carole McCann, Preminda Jacob, Molly Jones-Lewis, and Stephen Freeland, will reflect on the issues that the poster and its presentation raise for scholarship and our academic community, and audience members will be welcomed to join in the dialogue. Images: URCAD 2016 posters, performances, and presentations by (from top to bottom) Taisha Gainor ’16, political science; Elise Donkor ’16, computer engineering; Nerissa Vasconcells ’16, dance; and Mark Reynolds ’78, ’82 M.A., psychology. All photos by Marlayna Demond ’11 for UMBC.